Join Strong Bad in his quest to find his Snake Boxer V videogame and save the world, or something like that! For those who like the look of this comical point and click adventure, the good news is it isn’t too far off now. 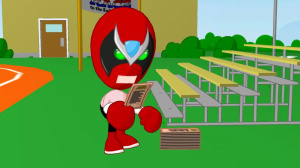 Strong Bad Episode 1: Homestar Ruiner looks all set to join the WiiWare fraternity in July. We've updated our screenshots page with a few more scenes from the upcoming game today also. Oh my god I want this so much! But I only have 55 blocks left. So unless I have room for it after deleting the Nintendo Channel, I will wait for the HD fix...please! There be some vc or wiiware games you haven't finished. Go finish them and free them. This game is looking pretty convincing with this new trailer.....I wonder how the rest of the game is. Okay, I LOL'd during a trailer. That doesn't happen often. It's the Strong Bad demo... >dun dun-dun!< ...And that's about all there is. If it wasn't for the fact that this game is like 500 points every month for to get the full game, I'd say it looks good. But that really puts me off for what you're getting. Obviously it's hard to tell just what you're getting from these, so I'll be interested in the WWW review. Can't wait...Strong Bad is the Man. Now we need an extenal hard drive more than ever. If each one has full voice overs, it should be around the max 41 MB... 250 total. The Wii has 512 MB, and we can't use it all, so this will be bad. Ok... so just finish one, delete, and download the next. LAME i know, but there is always the "good" ol' SD card LOL !